Part six - Gaza police - legitimate targets or targeted civilians? Part six of a series recounting the findings of South African jurist Richard Goldstone's UN Fact Finding Mission on the Gaza Conflict. As Israel's massive air assault entered its sixth consecutive day on New Year's Day one year ago, some 410 Gazans were dead and as many as 2,000 injured. Among 70 airstrikes on 40 targets on 1 January 2009 was a police command center in Rafah, the then-latest security site to be leveled. No one was hurt in that attack, but 248 members of the Gaza police were killed during Israel's overall assault. By late January 2009, more than one out of every six casualties was a member of the de facto government's security forces. On the same day, Gaza police spokesperson Islam Shahwan announced to the media that police commanders had managed to hold three meetings at secret locations since the beginning of the assault. Shahwan added that "an action plan has been put forward, and we have conducted an assessment of the situation and a general alert has been declared by the police and among the security forces in case of any emergency or a ground invasion. Police officers received clear orders from the leadership to face the enemy, if the Gaza Strip were to be invaded." This statement has become key to supporters of what they view was Israel's right to target police during its assault. "Except for the statements of the police spokesperson, the Israel Government has presented no other basis on which a presumption can be made against the overall civilian nature of the police in Gaza," noted Richard Goldstone's UN fact-finding mission, which investigated the assault. His team sought clarification from the police spokesperson, who responded that he had been correctly quoted, except that the instructions given at that meeting were to the effect that in the event of a ground invasion, and particularly if Israeli forces were to enter urban areas in Gaza, police were to continue their work of ensuring basic food stuffs reached the population, of directing the population to safe places, and of upholding public order in the face of the invasion. Shahwan further stated that not a single policeman had been killed in combat during the armed operations, proving that the instructions had been strictly obeyed by the policemen, according to the final report of the UN Fact Finding Mission on the Gaza Conflict. After an exhaustive explanation of its findings on the matter, the report concludes that the official's statement "cannot, on its own, justify the assertion that the police were part and parcel of the armed forces," noting that the remarks came days after the main attacks on police forces were carried out on 27 December 2008. The general rule of international humanitarian law is that members of law-enforcement agencies are considered part of the civilian population, unless they have been incorporated into the armed forces of a party to the conflict. "The obligation to distinguish at all times between the civilian population and combatants and to direct attacks only against military objectives (the principle of distinction) therefore generally prohibits attacks against members of the law-enforcement agencies," the Goldstone report states. "This principle is accepted by the Israeli Government." First, if the law-enforcement agency or the unit to which the policeman belongs has been "incorporated" into the armed forces, thus conferring combatant status upon its members. Second, if individual members of the law-enforcement agency are at the same time members of an armed group, they would be combatants. Thirdly, individual members of the law-enforcement agency, like any civilians, may not be targeted "unless and for such time as they take a direct part in hostilities." Israel's position, described in a Foreign Ministry publication, "The operation in Gaza: Factual and legal aspects," is that "due to their military functions, these internal security forces were not accorded the immunity from attack generally granted to civilians." It alleges that, in May 2006, Hamas formed the Executive Force as a loyal militia, “[drawing] this paramilitary force largely from its military wing, the Izz al-Din al-Qassam Brigades, and armed the members with anti-tank missiles, mortars, machine guns and grenades. The newly recruited commanders and subordinates were not obliged to give up their military wing affiliation, and continued to operate simultaneously in both functions." Israel further alleges that after the June 2007 seizure of full control over Gaza, Hamas restructured the Executive Force and subdivided it into several units, including the police, who "assumed many traditional law enforcement functions." It goes on to say that its members, however, remained members of Hamas' military wing and their weaponry continued to include machine guns and anti-tank weapons. "[…] the former Executive Force continued to be closely integrated with — although not formally part of — the al-Qassam Brigades. […] many members of the internal security services also served directly in the al-Qassam Brigades." Regarding the assault, Israel alleges that "Hamas intended to, and did, in fact, employ its internal security forces for military activities during the Gaza Operation." It further alleges that the "collective role of the Gaza 'police' as an integral part of Hamas armed forces is further evidenced by the fact that many Gaza 'policemen' were also members of the al-Qassam Brigades." To support this allegation, an Israeli government paper shows pictures of four men killed during the operations. Each is shown in two pictures purportedly downloaded from Palestinian websites, one identifying the man as a policeman, the other as a member of Al-Qassam Brigades, Hamas' military wing. Finally, the paper refers to a report (in Hebrew) by the Orient Research Group Ltd., an Israeli organization commissioned by then Israeli Prime Minister Ehud Olmert to produce the study. According to its report, "more than nine out of every ten alleged 'civilian police' were found to be armed terrorist activists and combatants directly engaged in hostilities against Israel." Israel's characterization of the Gaza internal security forces differs sharply from the tasks of the police as they are described on the official website of the Gaza Ministry of Interior, in orders to the police issued by the minister of interior, and in interviews with the director of police and the police spokesman conducted by Goldstone's inquiry. Gaza police director Gen. Jamal Al-Jarrah, also known as Abu Obeidah, told the mission that "the role of the police is to solve problems of the population, combat drug trafficking, arrest criminals." He reported that they are equipped with Kalashnikov firearms and batons, as the authorities have not been able to obtain other equipment, such as tear gas and small guns. The police orders and the ministry's website similarly describe the police as a law-enforcement agency. As to allegations that the police and Al-Qassam Brigades were "interchangeable," Gen. Jamal Al-Jarrah asserted that they were "absolutely not true." According to the police spokesperson, during the assault their mandate was firstly to "protect the internal front," i.e., ensure that the relationship between the civilian population and the authorities stayed "intact." Secondly, police were to monitor the distribution of humanitarian goods to the civilian population. Thirdly, they were to continue regular law-enforcement duties, with a particular focus on combating looting and speculation on prices. The report commissioned by Olmert identified 345 men allegedly belonging to the Gaza internal security forces killed by Israeli attacks. It identifies 240 of the 345 alleged members as members of the police. This figure is very close to the number provided by the de facto government, which was 248 policeman killed during the war. However, the UN report could not confirm the study's findings, as they "appear to be based merely on an equation of membership in Hamas (in itself alleged on the basis of unverifiable information) with membership in al-Qassam Brigades" in about half the cases. Goldstone's report states that "there is insufficient information to conclude that the Gaza police as a whole had been "incorporated into the armed forces of the Gaza authorities. Accordingly, the policemen killed cannot be considered to have been combatants by virtue of their membership in the police." For instance, many of those officers, including director of police Tawfiq Jabr who was killed on 27 December, were generally known as not being affiliated with Hamas. Several of the station commanders interviewed by the commission were also not Hamas affiliates but men who had joined the Palestinian Authority's police after the Oslo Accords allowed Palestinians to constitute their own law enforcement. They had thus served in the PA police in Gaza for more than 10 years before Hamas seized control in June 2007. No matter what their affiliation, however, the commission examined whether the attacks on the police stations could be justified on the basis that there were, allegedly, members of Palestinian armed groups among the policemen. "The question would thus be one of proportionality," the report states, as international law prohibits launching attacks "which may be expected to cause incidental loss of civilian life, injury to civilians, damage to civilian objects, or a combination thereof, which would be excessive in relation to the concrete and direct military advantage anticipated." The report allows for the possibility and "has earlier accepted that there may be individual members of the Gaza police that were at the same time members of al-Qassam Brigades or other Palestinian armed groups and thus combatants." However, it notes, even if the Israeli military had reliable information that some individual members of the police were also members of armed groups, "this did not deprive the whole police force of its status as a civilian law-enforcement agency." In other words, even if Israel's targeting of the police were based on certain members' affiliation, the attacks were disproportionate, according to the report, which found that "the deliberate killing of 99 members of the police at the police headquarters and three police stations during the first minutes of the military operations, while they were engaged in civilian tasks inside civilian police facilities, constitutes an attack which failed to strike an acceptable balance between the direct military advantage anticipated (i.e. the killing of those policemen who may have been members of Palestinian armed groups) and the loss of civilian life (i.e. the other policemen killed and members of the public who would inevitably have been present or in the vicinity). "The attacks on the Arafat City police headquarters and the Abbas Street police station, al-Tuffah police station and the Deir al-Balah investigative police station constituted disproportionate attacks in violation of customary international humanitarian law. "From the facts available to it, the Mission further believes that there has been a violation of the inherent right to life of those members of the police killed in the attacks [of 27 December] who were not members of armed groups by depriving them arbitrarily of their life in violation of article 6 of the International Covenant on Civil and Political Rights." Regarding specifically the attack on the police headquarters in Gaza, the report notes that in all likelihood, the policemen killed there "were neither engaged in any military activity at the time of the attacks nor carrying out preparations for combat." At the other police stations, they "were engaged in a range of routine tasks, including questioning detainees and handling issues for members of the public who were present in police facilities in the middle of an ordinary day," the report notes, and "cannot be said to have been taking a direct part in hostilities. Thus, they did not lose their civilian immunity from direct attack as civilians on this ground." Part five of a series recounting the findings of South African jurist Richard Goldstone's UN Fact Finding Mission on the Gaza Conflict. 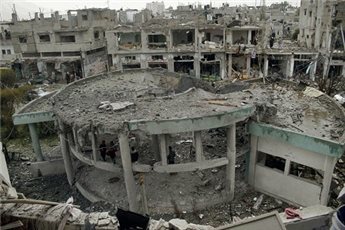 The Palestinian Legislative Council (PLC) building in central Gaza City was, according to the Israeli military, attacked on 31 December 2008, the fifth day of its massive assault on the besieged coastal enclave. Ahmad Bahar, then acting speaker of the PLC in Gaza, told Richard Goldstone's UN fact-finding mission that the parliament building was hit by three missiles launched from fighter planes. "serve as a critical component of the terrorist groups' infrastructure in Gaza" and "constitute part of Hamas's mechanism of control." Goldstone's report, however, rejected the analysis of Israeli officials that, because of the alleged nature of the Hamas government in Gaza, the distinction between civilian and military parts of the government infrastructure is no longer relevant in relation to Israel’s conflict with Hamas. This analysis is accompanied, the report notes, in the statements of senior Israeli officials, by an explicit argument that Israel should "put pressure" on Hamas by targeting civilian infrastructure to attain its war aims. "[T]his is a dangerous argument that should be vigorously rejected as incompatible with the cardinal principle of distinction. International humanitarian law prohibits attacks against targets that do not make an effective contribution to military action," the report states. Israel's explanation was integrated and elaborated on by numerous statements made by current and former senior government officials to the media. "This operation is different from previous ones. We have set a high goal which we are aiming for. We are hitting not only terrorists and launchers, but also the whole Hamas government and all its wings. […] We are hitting government buildings, production factories, security wings and more. We are demanding governmental responsibility from Hamas and are not making distinctions between the various wings. After this operation there will not be one Hamas building left standing in Gaza, and we plan to change the rules of the game." Israeli armed forces' spokesman Captain Benjamin Rutland stated: "Our definition is that anyone who is involved with terrorism within Hamas is a valid target. This ranges from the strictly military institutions and includes the political institutions that provide the logistical funding and human resources for the terrorist arm." Matti Steinberg, a former senior adviser to the Israeli General Security Services, argued that "Hamas's civilian infrastructure is a very, very sensitive target. If you want to put pressure on them, this is how." According to the Goldstone report, all these statements imply, in the view of their authors, "in order to be effective, military operations have to be directed not only against military targets but also against the non-military infrastructure." "The Israeli Government's discussion of the 'targeting of Hamas terrorist infrastructure' asserts that, 'consistent with the principle of distinction, IDF forces attacked military targets directly connected to Hamas and other terrorist organizations' military activities against Israel." This statement is followed by a list of examples of objectives, such as command posts of Al-Qassam Brigades, alleged weapons storage sites and training camps, rocket and mortar launch sites, and tunnels. The list also refers twice to a location identified as the office of Ismail Haniyeh, "head of the Hamas administration." This list is followed, however, by a statement reiterating and elaborating the argument that there is really no distinction to be made between military and civilian objectives as far as government and public administration in Gaza are concerned. "While Hamas operates ministries and is in charge of a variety of administrative and traditionally governmental functions in the Gaza Strip, it still remains a terrorist organization. Many of the ostensibly civilian elements of its regime are in reality active components of its terrorist and military efforts. Indeed, Hamas does not separate its civilian and military activities in the manner in which a legitimate government might. Instead, Hamas uses apparatuses under its control, including quasi-governmental institutions, to promote its terrorist activity," the statement says. Goldstone's report states that "In assessing the Israeli strikes against the Legislative Council building," the commission "first of all notes that Hamas is an organization with distinct political, military and social welfare components. "Since July 2007 Hamas has been the de facto government authority in Gaza. As recognized by the Israeli Government, the Hamas-led authorities in Gaza have been responsible for the civilian administration of Gaza. For instance, they employ civil servants and workers, run schools, hospitals, traffic police and the administration of justice. "The fact that these institutions and the buildings housing them have been administered by authorities led by Hamas since July 2007, and no longer by a government composed of both Hamas and Fatah members has, in the view of the Mission, no bearing on the continued civilian character of these institutions." Goldstone's team met with Gaza-based Legislative Council members belonging to Hamas, to Fatah and to the Popular Front for the Liberation of Palestine. While Hamas constitutes the de facto authority in Gaza, "the buildings attacked and destroyed served a public purpose that cannot be regarded as 'promoting Hamas terrorist activity,'" according to the report. The report observes that there is nothing unique in the fact that in Gaza ministries and prisons are part of the government's "mechanism of control" and that the legislature's assembly hall and administrative buildings are a critical component of the government infrastructure. "That is not, however, the test applied by international humanitarian law and accepted State practice to distinguish between civilian and military objects," the report notes, adding that international humanitarian law "recognizes a category of civilian objects which may nonetheless be targeted in the course of armed conflict to the extent that they have a 'dual use.'" Examples often made for such dual-use objects, which serve both civilian and military purposes, are civilian infrastructures such as telecommunications, power-generating stations or bridges, in so far as they are used by the military in addition to their civilian use. "There is no indication, nor any allegation of any such dual use of the Legislative Council building," according to the report. "There is an absence of evidence or, indeed, any allegation from the Israeli Government and armed forces that the Legislative Council building, the Ministry of Justice or the Gaza main prison 'made an effective contribution to military action.' On the information available to it, the Mission finds that the attacks on these buildings constituted deliberate attacks on civilian objects in violation of the rule of customary international humanitarian law whereby attacks must be strictly limited to military objectives," the report adds. "In the Mission's view these facts further indicate the commission of the grave breach of extensive destruction of property, not justified by military necessity and carried out unlawfully and wantonly, as defined in article 147 of the Fourth Geneva Convention." The mission noted that such attacks "that are not directed against military (or dual use) objectives are violations of the laws of war, no matter how promising the attacker considers them from a strategic or political point of view." Part four of a series recounting the findings of South African jurist Richard Goldstone's UN Fact Finding Mission on the Gaza Conflict. At least 375 Palestinians were dead and 1,720 injured, hundreds seriously, by the end of the fourth full day of Israeli airstrikes on Gaza one year ago today. In Beit Hanoun, Israeli missiles killed two Palestinian girls, four- and 11-year-old sisters, just one day after a mother lost five daughters in a strike on Jabaliya refugee camp the day before. The attacks, two of dozens that had killed more than 20 children since the military embarked on its operation, sparked a flurry of media reports despite Israel's best efforts to prevent international journalists from reporting the devastation in Gaza. While Israel's Foreign Ministry opened an international media broadcast center in Sderot the day after its assault began on 27 December 2008, and organized tours for members of the press in the city and its environs, the country banned foreign reporters from entering the war zone. The army also banned reporters from approaching Israeli soil within two kilometers of the coastal Palestinian enclave, declaring both areas a joint "closed military zone." On 30 December, a coalition of hundreds of locally-based journalists petitioned Israel's High Court over the ban. "[T]he world’s media is unable to accurately report on events inside Gaza at this critical time ... Despite our protests, the Israeli authorities have refused to let journalists in ... Never before have journalists been prevented from doing their work in this way. We believe it is vital that journalists be allowed to find out for themselves what is going on in Gaza. Israel controls access to Gaza. Israel must allow professional journalists access to this important story." In an open letter published the day before, the Foreign Press Association also protested "in the strongest terms the army's imposition of 'closed military zone' on everything along the Gaza Strip border inside Israel. The Foreign media should have unrestricted access to all Israeli villages and towns under attack and the freedom to cover all sides of the conflict zone at a time like this. The claim that this is being done 'for our protection' is patently ridiculous." Israeli citizens, including journalists, had been barred from entering Gaza since the abduction in 2006 of Gilad Shalit, an Israeli soldier, on security grounds. One journalist, Amira Hass, has been arrested on two occasions, in December 2008 and May 2009, for being in Gaza "illegally." "The media ban, coupled with the comments made by the director of the Israeli Press Office have raised concerns, aired in the media, that the ban was aimed at controlling the narrative of the conflict for political reasons," according to the final report Richard Goldstone's UN fact-finding mission. After the closure, on 5 November 2008, of the Gaza Strip to journalists (among other groups, including human rights monitors), there was international and domestic protest; the ban was lifted briefly on 4 December 2008, but reinstated the following day. At the start of the military operations in Gaza, Israeli security officials indicated that there would be a complete ban on access of the media to Gaza for the duration of the operations. On 19 November 2008, the heads of many international news organizations, including the BBC, CNN and Reuters, protested against the ban in a letter to the then President Ehud Olmert. On 24 December 2008, the FPA petitioned the Supreme Court over the ban. On 31 December 2008, the Supreme Court ruled on the FPA's petition, ordering that the Government of Israel grant 12 journalists entry into Gaza each time the Erez crossing opened. The army refused. On 2 January 2009, the court amended its order to state that eight journalists, rather than 12, should be admitted whenever the Erez crossing opened. On 8 January 2009, the Israeli authorities briefly gave the BBC and two Israeli channels access to accompany Israeli forces into Gaza. On 22 January 2009, access was granted to eight journalists to accompany Israeli forces into Gaza. The media and non-governmental organizations continued to complain about the lack of independent, unfettered access to Gaza. On the same day, the United Nations Chief of Communications and Public Information called on the Israel to ensure immediate access to the international media to Gaza, stressing the need for “full and independent” coverage of events.